Welcome to our new Environmental Website. You can use the search functions on the left-hand side of the page to search for your school and see what activities you're involved in. You can also search by category to see what other schools in your district are doing. Feel free to explore this site to learn more about what students just like you are doing to be good stewards of the environment. Why Are Student Activities Important? What better way to learn about something than to do it yourself? Students in Broward County have hands-on exposure to lots of environmental activities, including habitat restoration, planting gardens and vegetables, science experiments, and even building a solar vehicle! Through exposure to environmental activities, students can see that every single person has the ability to make a difference. Scroll through the list below to learn more about Broward Students Going Green! Almost every school in Broward County is participating in some type of clean-up effort. Clean-ups can be done at the beach, local parks, streets and roadways, and even the school campus. We all realize that garbage doesn't just look bad, it is also a hazard to the natural cycles in sensitive environments. Clean-ups also involve the removal of exotic plants and animals that may also be doing great harm to the environment. Elementary school students are participating in after school litter picks ups and some schools have collected up to 15.5 pounds of trash. Middle school students are heading out to the beach on weekends to pick up garbage and participate in events like the Broward County Waterway cleanup. High school students are cleaning up our plants by removing exotics and planting natives at the Fern Forest Volunteer Days. Every school in Broward County has some type of environmental club or organization. Clubs allow students to interact with friends and peers while performing vital tasks that protect our envirnoment. From common clubs like the Green Team and Environmental Club to more unique clubs like the Recycling Rangers and the Butterfly Club, Broward has its fair share of students wanting to get involved. Broward Schools celebrate success by hosting and participating in unique community events around the County. Broward students have participated in Green Day, Arbor Day, Broward Water Matters Day, NatureScape Broward, Environmental Open House, Go Wild in the Park Environmental Festival, and Art in the Park. Some schools have created their own environmentally inspired events like Recycled Prom, Waste-Free Lunch Days, and the Eco FunFest! Broward Students get out in the field. Students have gone to the Everglades Experience Field Studies to learn about the Everglades through a hands-on interdisciplinary approach, the Miami Seaquarium to learn about the aquatic world, and have canoed in the Loxahatchee River, snorkeled in Key Largo and went air-boating in the Everglades! They’ve also gone to numerous nature parks to learn about the plants and animals of Florida. Getting out to learn about nature is essential in understanding the complex relationships of the natural world. Providing natural areas for insects and animals to live is essential to protecting our sensitive areas. Delicate food webs are established when new areas are created. Our schools work to provide natural areas with food, water, and shelter for the native species of South Florida. In some cases, areas have been constructed to support migratory species that visit our location once a year; purple martin houses attract the migratory birds so students can observe their behavior. One school adopted threatened tortoises and made a school habitat for them to live in. Students have planted sea oats and sea grapes at the beach to provide a shelter for sea turtle hatchlings from the lights of Port Everglades. In all cases, these natural habitats are an important cornerstone for the environmental programs at our schools. Our schools have a variety of areas dedicated to cultivation of special plants grown organically – without harmful materials that may damage the environment: vegetable gardens, hydroponic fruit gardens, and even pizza gardens. Yes, that’s right! Broward Students have even managed to build a pizza garden complete with many of the items needed for that famous Italian pie - ripe tomatoes, fresh wheat, and tasty herbs. Students will make pizzas after their ingredients are ready, which gives them a full-circle perspective on what it takes to make a meal! Gardening allows students to learn about safe and effective organic techniques for growing their own food. “Turn it off!” sing the students of Whispering Pines Center in a homemade rap song meant to inspire others to be eco-conscious. Students all over Broward are coming up with creative ways to remind each other that it’s cool to save electricity. When students see lights on in an empty room, they go in and place a sticky note on the switch, reminding everyone to shut the lights off. Technological devices are unplugged when not in use and printers are localized to reduce electrical consumption. Environmental clubs discuss energy conservation and how easily it can be done and have learned the difference between energy efficiency and energy conservation! 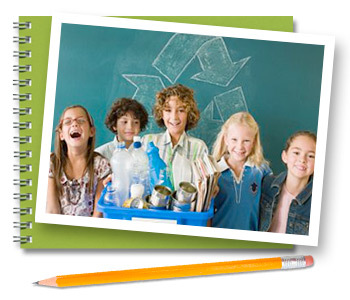 Paper, plastic, and aluminum recycling can be found throughout the vast majority of schools. Some schools delegate a different student per class each month to lead recycling efforts and other schools offer pizza parties and prizes to classes who collect the most recycled materials. Recycling of old cell phones, print cartridges, and even glasses is also done. Many schools have incorporated waterless urinals, automatic sinks, and kitchen sinks with pedals to decrease water usage. Students that don’t have these appliances in their school have learned to tightly fasten sink handles, shut off water when washing hands, and to spread that message to their fellow classmates. Poetry, writing, art, and poster submissions get sent in from across the District to contests like the “Broward County Water and Wastewater Poster Coloring Contest” and the “Everglades Eyes Contest.” Students submit items for display at events like the Broward County Marine Science Fair and have had great success in doing so!